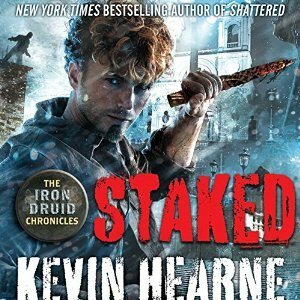 My audio binge continues with Staked by Kevin Hearne the eighth novel in the Iron Druid Chronicles. This is the most current novel in the series, excluding the novellas and will leave me waiting for the final book in this series. Staked was action-packed, and shared events from the past as our characters dealt with trolls, witches, vampires and more. Once again we a treated to three POVs and three storylines but unlike Shattered these work seamlessly. Atticus has issues with the vampires and their leader Theophilus. Enough is enough and its time to take a stand. To do this, he will face danger, severe ties, suffer loss and will end up carrying guilt but with a price on the druid’s heads, Atticus is determined to be the victor. 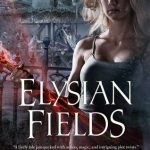 This thread has him reconnecting with characters from previous books as he does quite a bit of traveling in his quest. The Hammers of God was an interesting thread and I loved how Hearne brought them back in and feed my quest for knowledge regarding them. The Dark Elves also made an appearance and continue to fascinate me. 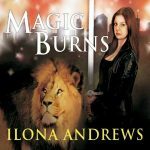 After Granuaile ‘s experiences in India, she is determined to be free of the mark, the Norse God Loki set upon her. To do this she enlists the help of the gods and the witches in Poland. This was an intense thread that has her facing several Slavic nightmares. She also continued her quest regarding her stepfather. I like Granuaile but I would be lying if I didn’t say that her POV sometimes grates on my nerves. She is passionate but also youthful in her reactions. The third POV is Owen, who has decided to teach again and is spending time with a certain werewolf and her clan. In Staked, Owen has a wee bit of trouble with trolls. This thread was intense, heartbreaking and tied to the overall series ARC as Owen makes a startling discovery concerning an enemy. Oberon and Orliath were present and added humor, emotion, and talks of food to the story. While I enjoy Orilath, but Oberon continues to steal the show. One of my favorite side stories in Staked had to do with a ghost and I enjoyed how Hearne both shared events from Atticus’s past and addressed ghostly entities. The stories eventually wove together when Atticus and the other druids join him in Rome as he takes on Theophilus. These final scenes were intense and had me sitting up straight and listening intensely. Luke Daniels continues to narrate the series and I think he will be as sad as I will be when the final novel releases. Thankfully, he narrates Hearne’s new series and many other titles. Loss, threats, closure to arc threads and a build up to what is still to come made Staked an addictive addition to the Iron Druid Chronicles. Non-stop action, humor and Atticus’s charm *winks* had me devouring Staked in a single day. Be still my heart. I love Robert Petkoff too! Everyone seems to love this series! I hear nothing but good things. Glad the three POVs worked so well. The emotion and humor sounds great, and so does Oberon lol. I think works it because it is late in the series. I love the Illuminae Files series and got the last book this week, but I am savoring it for after Take Control. This is such a long series but that doesn’t matter when you enjoy it so much! I might try the first book in the series, although I rarely read series (and finish them even rarely). This sounds interesting and a little intense! 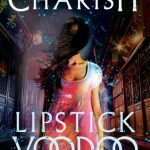 It’s been awhile since I’ve read a book with druids (especially one where they play a large role), and forever since I’ve read something with vampires. I might have to look into this audiobook! Love your click to tweet quote!! 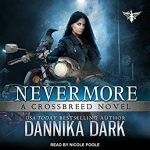 And this series sounds so good… I’ve vaguely hard of the Iron Druid series but didn’t realize they’d sound this fun and you can’t beat a well narrated series!! Great review. I am so glad that you enjoyed all of the installments in this series as much as you did. I have the first four ready to go and hope to start very soon. Now you have caught up, that was a lot of binge listening. I finished this one feeling anxious as to what is going to come. I am so worried. This series is making me think of Barnabas Collins and the old TV soap, “Dark Shadows.” Enjoy the weekend. Seriously, this summer Kim I am all over this series! Have a wonderful weekend!! I have many books to read there! It’s great that it continues to be that good! I get sad when a beloved series ends as well. i am so happy that you are enjoying these books so much. Great review Kimberly! This series sounds SO good! I can’t wait for you to listen to the final novel 😀 In the meantime, I’ll be sure to check the previous instalments!